In this post, I’ll explain how and why we deliberately broke things to observe the webchat user journey. Researching webchat in a realistic way is quite tricky. People only ever need to use webchat when they hit a problem. Once this has been resolved, their journey in a service comes to an abrupt end. So to research webchat we needed to test journeys that were impossible to complete without additional support. We had some doubts about this methodology. Is it ethical to break a user’s journey to test webchat? Will we still gain a true sense of people’s use of the service? How could we know which support channel they’d be most likely to use? By creating a ‘broken’ journey, would we be inflicting too much stress on participants? Despite these doubts, we went ahead and sent our users off on tricky journeys. We looked for research scenarios that were complex, but not too personal. We created prototypes that included a breaking point in a user journey. This meant giving people tasks they wouldn’t be able to complete and making information impossible to find. We looked at the whole user journey for this research, from the point at which the person started using the service, right to the end of their webchat session. We didn't just want to test people’s use of webchat, we wanted to see if they would choose it in the first place. In particular, we looked at the journey from the point when people started to struggle and needed help. We disabled phone and email support options in the prototypes, and we limited support exclusively to webchat. We did this discreetly because we didn’t want to influence user’s initial support channel choice too heavily. Information links were also disabled or stripped from pages. This meant people had to seek help to complete the tasks they'd been set. Although we didn’t explicitly tell people they’d be pushed to use webchat to get help, some users may have guessed this was our intention. We noticed that users who were resistant to using webchat seemed more likely to notice it was their only option. To counteract this, we ran shorter research sessions with fewer tests. We limited the amount of tasks to a maximum of 2 per person to make sure people wouldn’t be influenced by their first task. But a few users still realised we were testing webchat. It was especially clear when we had to prompt people to use it. Testing these broken journeys felt strange at first, but it taught us a lot about webchat. We found that when they were looking for help, only 2 of our 28 participants chose to use webchat. The rest looked at webchat only when we asked them to try it. Some people didn’t notice the webchat icons and didn’t realise it was an option. Most saw the webchat, but were reluctant to use it. And once people had tried webchat, they often said they would be keen to use it in the future. This included people who’d never used webchat before, or who were anxious about using it. Before we tried using these broken journeys, we weren’t sure whether they would work. But the approach taught us a lot about webchat, and about users’ wider support needs. We’ll be using these findings to help make our services stronger and more user friendly. If you’d like to have a copy of the webchat alpha patterns and findings, please do get in touch. Hiya - were users any more likely to use webchat on a future occasion, after their experience? Hello, many thanks for reading and getting in touch. Research findings showed most users were more inclined to use webchat in the future after using it in our prototype, even if it was their first time using webchat. We were, however, offering a high level of service generally - quick queue times, fast responses and a constrained problem that could be easily fixed. There’s much more to a webchat experience than just the UI. Worth noting that past experiences of webchat also play an important part in how users view this support channel. For example some people who’d used it before and had a bad experience, thought that using our prototype was easier to use in comparison. These users said they’d use webchat again in the future. While some people who were put off from using webchat because of their past experiences used ours and still didn’t want to use it again. And there were people who hadn’t used it previously, who were really nervous, but after using the prototype, said they’d use it again. 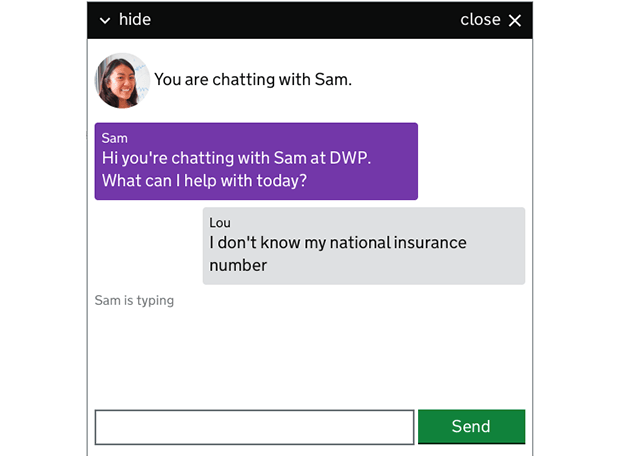 There’s more work to do about how to encourage users to try webchat - we know that even the term itself can be off-putting. I'm working on a project between Companeis House and HMRC, which aims to simplify the registration process of setting up a company and registering for the applicable taxes in the same sitting. The use of webchat has become more apparent from our user testing and is something we shall be looking at through the Beta phase. Hello Craig. Many thanks for reading and leaving a comment. We will be posting another blog on user research into webchat this week too. Hi Emma. Thanks for the blog post. I'm the Service Manager for the digital first careers service. We are proposing the use of webchat as a means for our users to get information as part of using the digital service. Webchat tested well in our alpha and we are now wanting to take this forward into beta. Would welcome being able to view your findings and having a catch up.